Start taking classes at Yoga General and other studios! Yoga General strives to be a community hub. It's a place to come to your first yoga class, to learn a couple of poses to help with those tight shoulders, or to get your flow on. Whether you're in spandex or sweatpants, you'll be comfortable in their space! 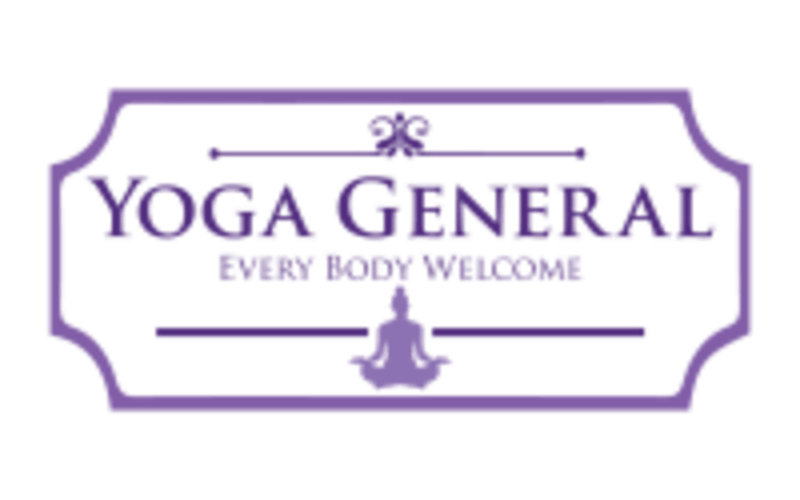 Whether you have an established yoga practice or you've been kind of sedentary for the last few years, Yoga General has got you covered. Yoga General aims to be a no-intimidation, no-judgement zone where you (yes, YOU!) can find YOUR way into yoga. From increased flexibility to greater strength to mental clarity to increased self-confidence, the benefits of yoga are too good not to share. With 3 different kinds of classes for beginners, lots of intermediate options, and a back care class, there's something for everyone. Teachers at Yoga General care about helping you to get what you came for - whether a great workout (YG Power Flow! ), a break from the hustle and bustle, or a better understanding of how to feel good in your body. For beginners ready to build strength and flexibility, try a "YG Foundations" class. If you're looking for something slower paced, or want support while healing from an injury, "YG Gentle" might be more your speed. "YG Restore" is a great way for anyone and everyone to reach a deeper sense of peace and calm in the body and mind. They are conveniently located in Decatur, GA near the Your Dekalb Farmers Market. They are right next door to the First Oriental Market. Plenty of free parking. Peaceful studio, plentiful parking and almost personalized class with only 3 in attendance on a Sunday morning! The instructor was great and explained which stretches were good for which muscle groups. It was just the right amount of challenge for me - I’ve taken a couple of yoga classes but not consistently. Good stretch and focus on mindfulness. Relaxed environment, excellent instructor with help hands-on alignment. Great class. The instructor was awesome and I love the space! This wasn’t what I expected. I was looking for a deep stretch combined with meditation. This was just relaxing in poses with lots of help from props. It was super relaxing and I understand why people enjoy it. But for me, it left a lot to be desired. Awesome instruction with light hands on. Excellent yoga workout that can meet a wide range of difficulty.